Looking for a quality pair of oxford shoes, I can't recommend local Nashville brand Nisolo more - perfect shoes, with an even better backstory! But really, this is what my #teacherstyle looks like of late. Stretchy, easy, & a touch of color to brighten up these dreary Winter days. How are you surviving the Winter slump? When is it reasonable to start the countdown to Spring Break? 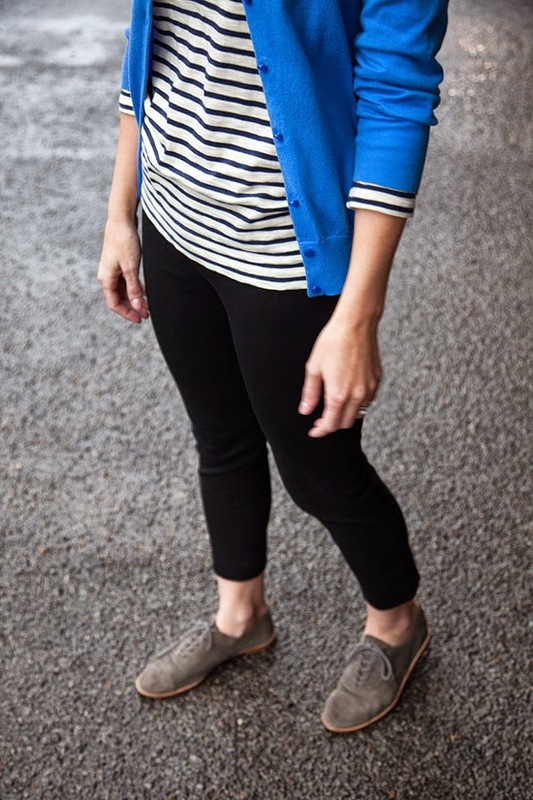 See all of my teacher capsule wardrobe style here. Cute! 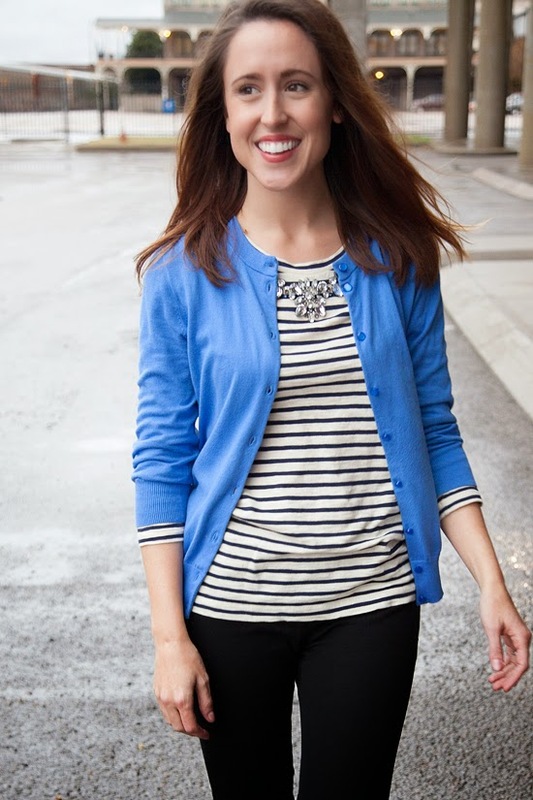 Loving the cardigan and stripes together! Great sweater and shoes! Yo look lovely in this casual outfit! Breton stripes are so chic! And love them paired with that blue! This outfit is so perfect! I love the classic-ness of it! Considering we had a snow storm yesterday, my countdown has already started! Bring on Spring! I love that striped top! So pretty! You are gorgeous! Love that color on you! I love your teacher style! My style is basically the same in the winter. I throw on whatever I can to not only stay warm, but provide comfort during those super chilly days. I have that striped top and I never thought to put a cardigan over it. I'll definitely be trying that. love seeing your real outfits - I think you have such a great simple style that is never boring. HOW DO YOU DO IT. ...seriously. I always feel like I need like 3 extra things to make it special. You look darling! I've been wanting to add a pair of oxfords to my closet to pair with skirts once it warms up a bit...which might not be for a few months haha. love this! that sweater is too cute! Totally feeling this look! Love the oxfords and that beautiful shade of blue! great shoes! you're also looking SO slim! Totally counts! The only plans I have for SB are to sleep for week straight… still counting it! I seriously can't get enough! Leopard and stripes are my two secrets for instant chic! Thanks lady, love these oldie but goodies from Gap! To be honest, I stress ate A LOT right before our wedding, and was happy to have lost a little weight, but might have overestimated how much teaching would affect my diet/overall health… definitely working on some healthier lifestyle goals in 2015. This outfit is so cute! I love the striped shirt with the embellished neckline. 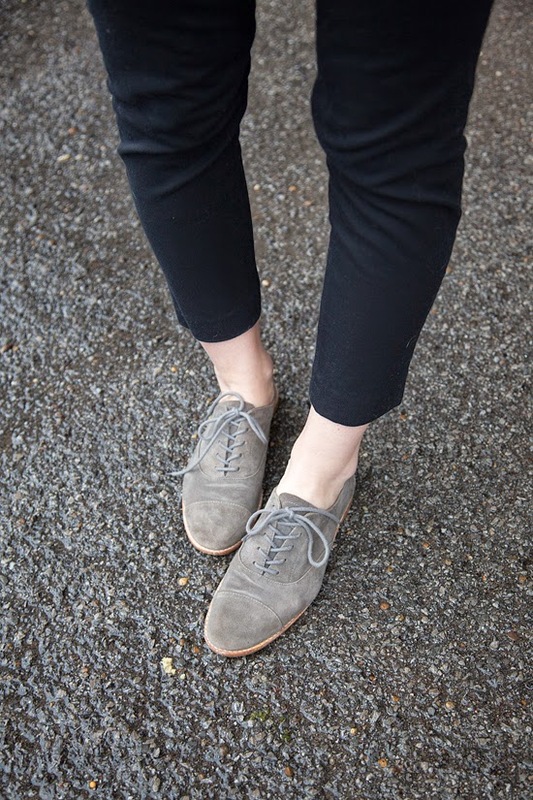 Those oxfords are awesome too. I have that cardigan in yellow and it really is the greatest! Although I've totally switched from cardis to blazers as of late. I love this combo! And totally applicable to any profession, not just teaching! Looks very comfy and professional at the same time! This outfit is the perfect mix of glam, preppy, and classic. Beautifully put together!